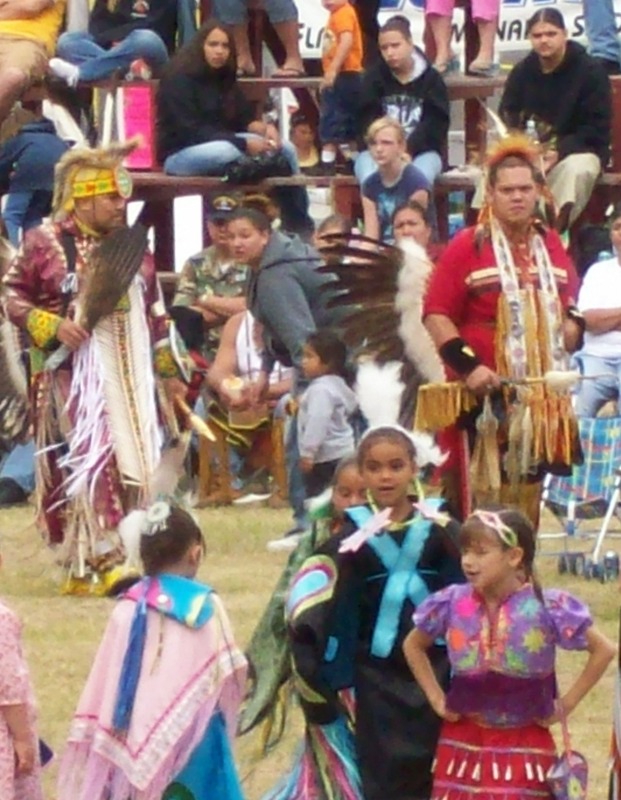 The Lac du Flambeau Bear River Pow Wow. Lac du Flambeau historic building restoration workshop. The Lac du Flambeau Band of Lake Superior Chippewa Indians called their home Waswagoning (place of spear fishing by torchlight). Known as Lac du Flambeau (Lake of Torches) by the French, it was formally established as a village site in 1745 by Kiishkenum (Chief Sharpened Stone). Chippewa is an English adaptation of Ojibwe, the true name of the tribe. The Lac du Flambeau Reservation (population 3,004) encompasses 86,500 acres and offers abundant rivers, wetlands, and a 10-lake chain, one of the densest concentrations of fresh water in the world. Fishing and heritage tourism have long been an important part of the economy. In the late 1800s, recreational fishing drew people from Chicago, Milwaukee, and Minneapolis. By the 1940s and ‘50s, more than 50 tribal members were employed as professional fishing guides, helping make the area a premiere resort community that showcased a recreated village, tribal arts and crafts, dancers, and drummers. The George W. Brown, Jr. Ojibwe Museum and Cultural Center helps educate the public about Ojibwe culture. The museum includes a 24-foot dugout canoe, traditional clothing, and provides access to historic materials, documents, photos, and exhibits. Year-round programs and classes are taught by experienced craftspeople. Lac du Flambeau is part of one of Wisconsin’s 12 designated heritage areas. One project that shows the community’s commitment to preserving and interpreting its cultural heritage is the Legacy of Survival. The project, which involves seven tribal partners, is restoring and interpreting the Boys Dormitory Building (1906) of the Bureau of Indian Affairs’ Government Boarding School Complex, listed in the National Register of Historic Places. The restoration is funded in part by a Save America’s Treasures grant, and the dormitory is expected to open as an interpretive center by the fall of 2009. Legacy of Survival honors the native children who made sacrifices to ensure the preservation of their culture and language. Following restoration, the property will house exhibits, archives, a research center, an Ojibwe language program, and educational programs regarding the history of government boarding schools and their impact on tribal communities. In the interim, presentations on the history of these schools and their devastating impact on tribal communities have reached a large and varied audience and increased the number of visitors to the museum. Recently, the community was awarded a Preserve America Grant of $142,680 for A Walk in the Footsteps of Our Elders project. This project will promote and enhance heritage tourism by developing an interpretive plan for the Boarding School Complex, sharing years of research by the Tribal Historic Preservation Office. The Lac du Flambeau Tribal Historic Preservation Office (THPO) and Cultural Committee survey and maintain an inventory of culturally significant properties, and monitor compliance with federal and tribal laws to protect the cultural identity and historic character of the territory. This includes consulting with federal agencies on projects that may affect properties within the boundaries of the reservation, and evaluating proposals for rehabilitation projects. The THPO has also developed a manual outlining the proper procedures to be followed to protect and preserve cultural and historical resources.